Miss Argentina Estefania Bernal (@estafaniaabernal) takes to Instagram her appreciation of the beauty of Boracay. It's almost full cast at the Miss Universe as around 60 candidates have arrived in Manila. The pre-pageant activities are also in full swing as select candidates are expected to tour around Boracay Island, Cebu and Vigan over the weekend. It's a whirlwind romance with just 15 days left 'til finals night. So let's get into the heads of these contestants by stalking their social media accounts. These are what they have been posting so far. Miss Philippines Maxine Medina appears on her first Miss Universe event and uploads this on her Instagram @maxine_medina, saying she's proud to be Pinay. Miss USA Deshauna Barber posted on her Instagram (@deshaunabarber) a photo of her with Miss Austria Djana Dzinic and Miss Brazil Raissa Santana with the caption "We're focused on building friendships." Seems like Miss USA is gunning for Miss Congeniality. 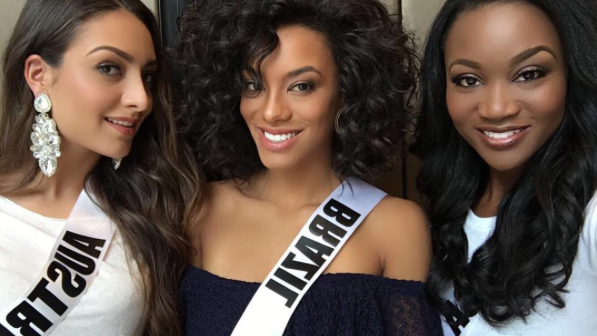 Black is beautiful according to roomies Miss USA Deshauna Barber and Miss Curacao Chanelle De Lau (@chanelledelau). Curacao made it to the Top 10 last year. Will we see a repeat? Game face on! Miss France Iris Mittenaire poses with her make-up artist after a hair and make-up session with sponsors Chi and Mac Cosmetics in Conrad Manila. Photo by @irismittenairemf. Miss Germany Johanna Acs (@johannaacs) poses with Miss Philippines. Miss Brazil Raissa Santana (@santana_raissa) proves she's one of the frontrunners with this head-to-toe selfie fierceness. 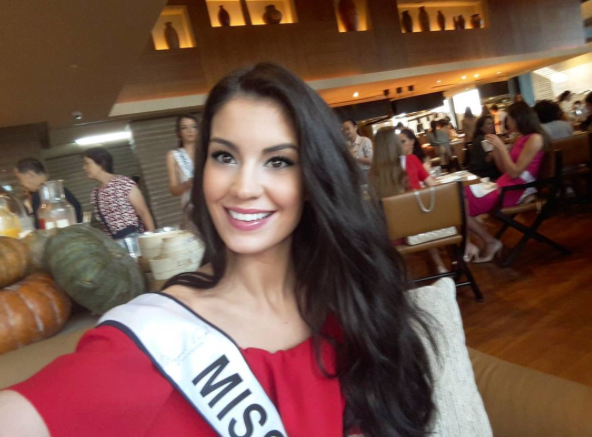 Another huge contender from Asia, Miss Malaysia Kiran Jassal (@kiran_jassal) takes a selfie with Miss Great Britain Jamie Lee Faulkner. Miss Namibia Lizelle Esterhuizen (@missuniversenamibia2016) poses for a souvenir photo with her pilots on their chartered flight to Boracay. Insiders say that with the dropping interests of Europeans about the Miss Universe, it maybe is the high time for a Miss Universe from that continent. Will it be Miss Netherlands Zoey Ivory (@zoeyivory)? Miss Peru Valeria Piazza (@valepiazzav) posted this photo with Miss Indonesia Kezia Warouw, Miss Guyana Soyini Fraser, and Miss Belgium Stephanie Geldhof. Miss Russia Yuliana Korolkova (@yulianakorolkova) poses for a beauty selfie shot with Miss Brazil. One of the prettiest faces this year, Miss Spain Noelia Freire (@noeliafreireb). Frontrunner Miss Venezuela Mariam Habach (@mariamhabach) was so happy with Miss Malaysia's gift that she posted it on Instagram.